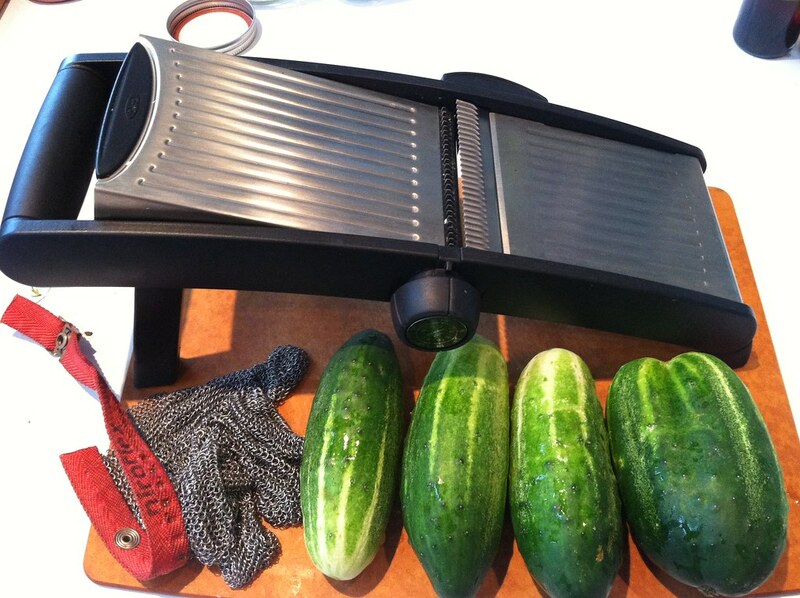 my first honey harvest and a recipe for easy honey serrano pickles – ugly food tastes better. Liquid Gold! 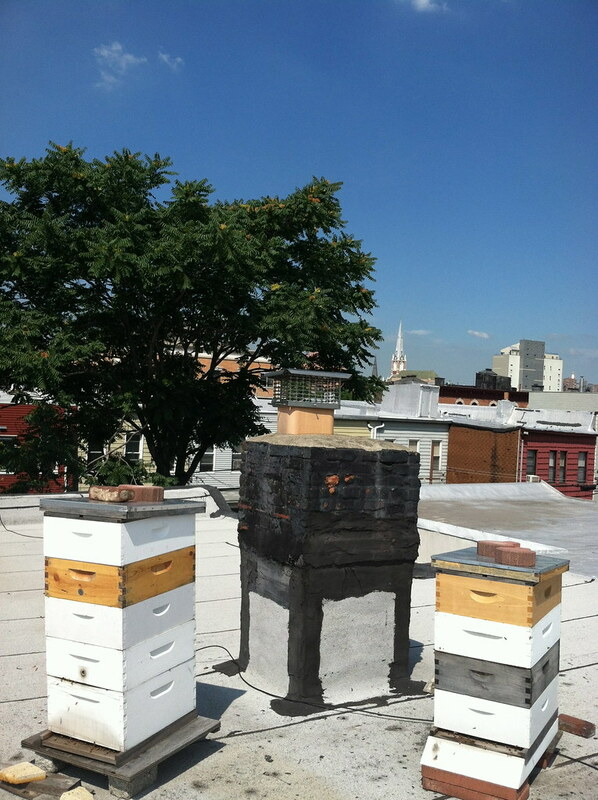 You might recall my previous duty of assembling bee hives.</a Recently, I had the pleasure of helping Meg at Brooklyn Homesteader to harvest honey for the CSA she does, and I have been dying to share my experience on her beautiful Brooklyn rooftop. First things first, light the smoker and calm the bees down. I wish someone would do this to me sometimes. Oh wait. 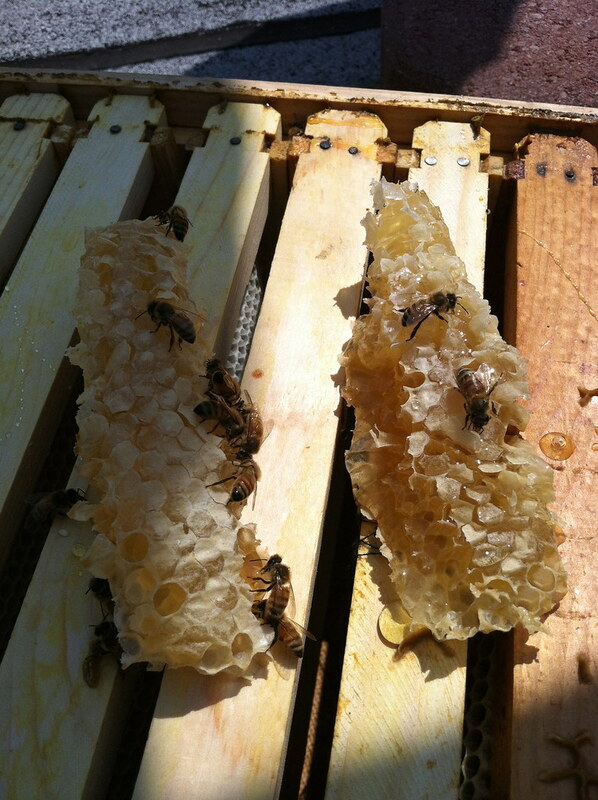 Once the bees are happy, you can carefully lift the tops off the hives. 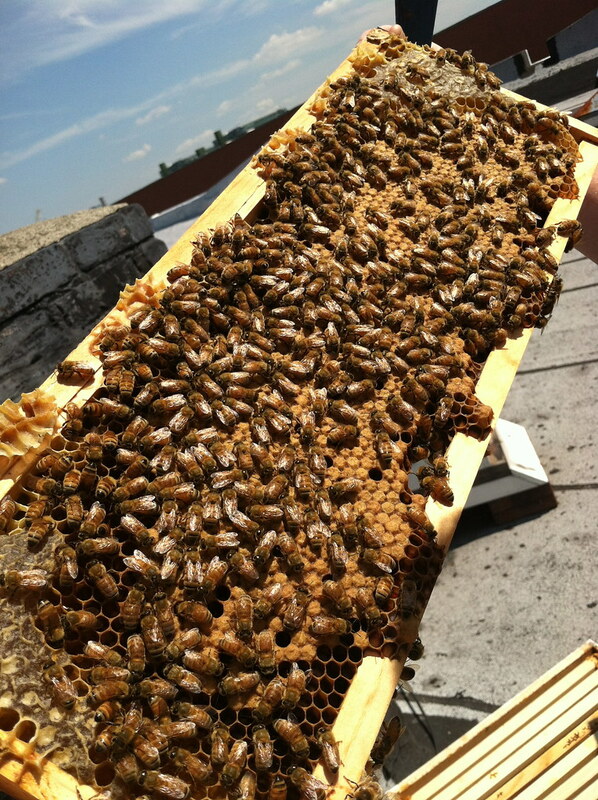 Sometimes the bees make comb on top of the hives and you need to scrape it off. Then you can start lifting out frames. 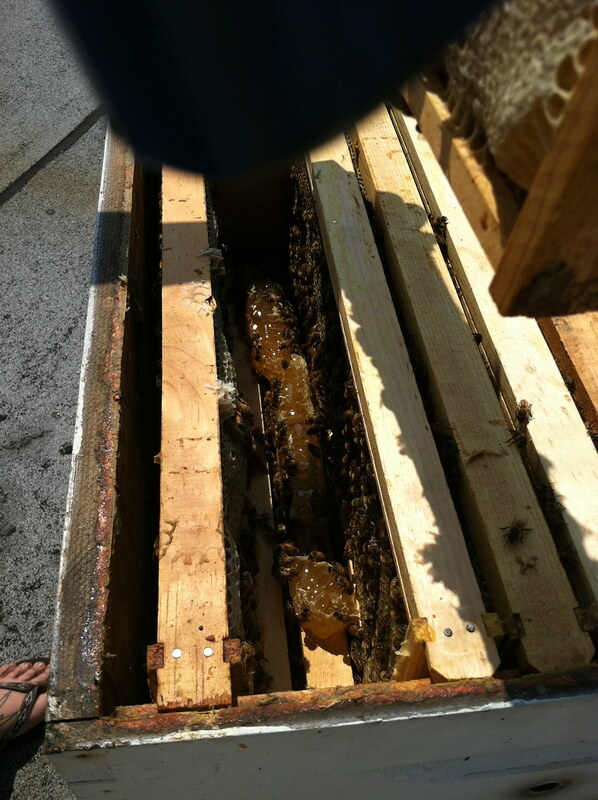 The first frame we lifted had honeycomb underneath it. This also needs to be removed. 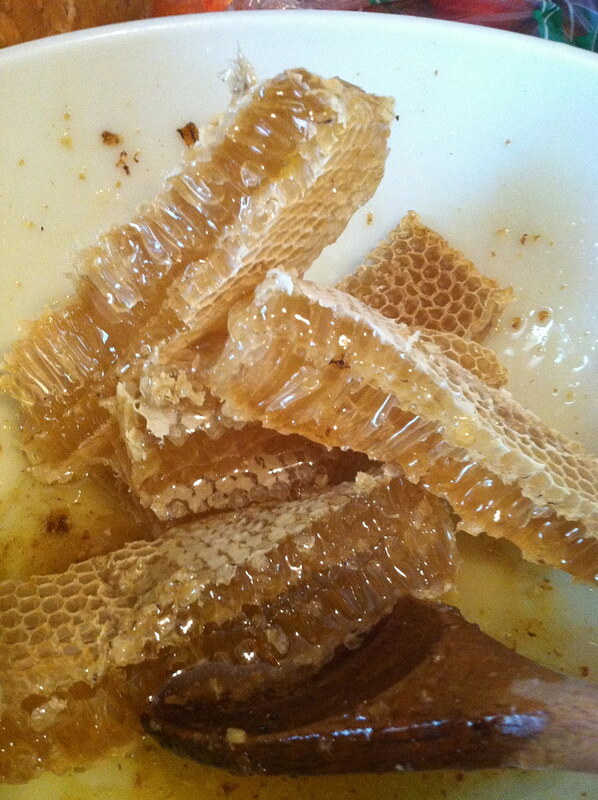 If you pull them out and set them down, the bees will clean them off and you can eat them. 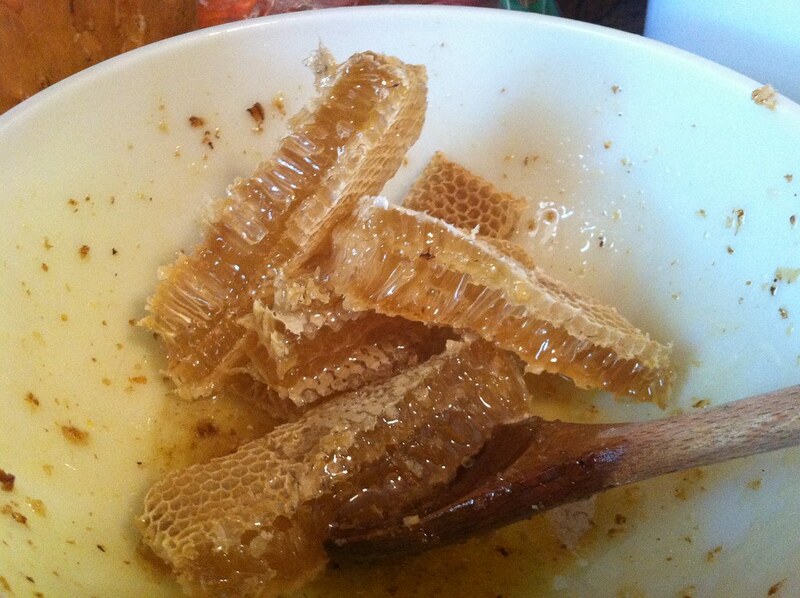 I haven’t had fresh honey right off the comb since I lived in Asheville as a child, so this was truly a treat, and check out the ridiculous color and texture on this! As for the frames themselves, you need to determine which frames can be taken out and harvested. 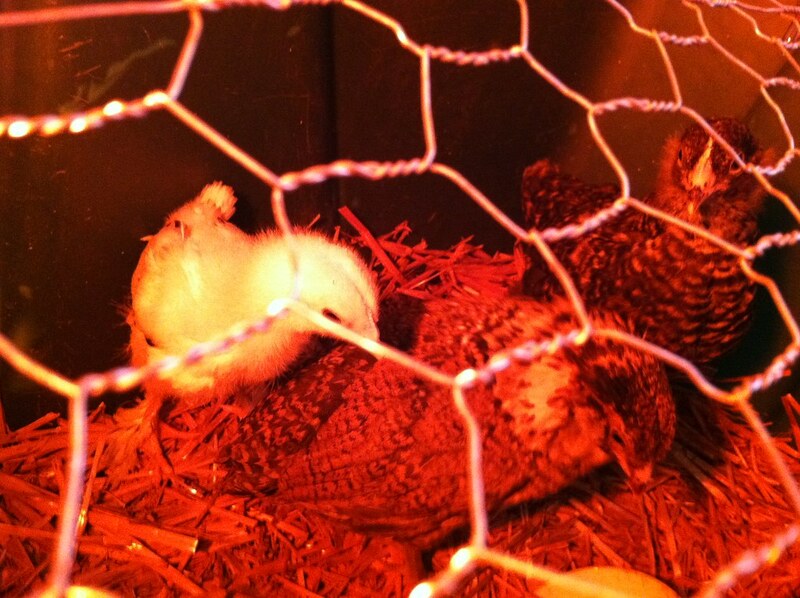 The darker brown frames as below have Brood in them, a.k.a. baby bees! 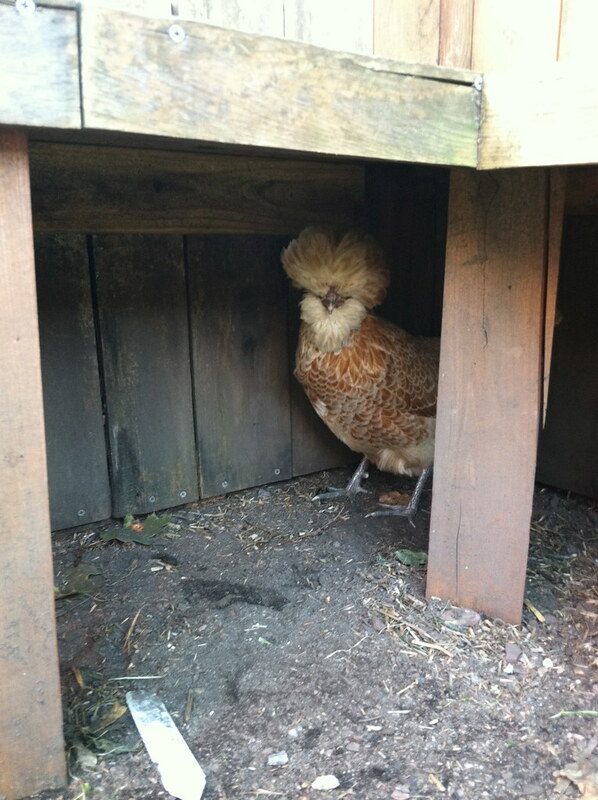 These need to go back in to the hive. When you get a full frame that has white caps, you are in luck! 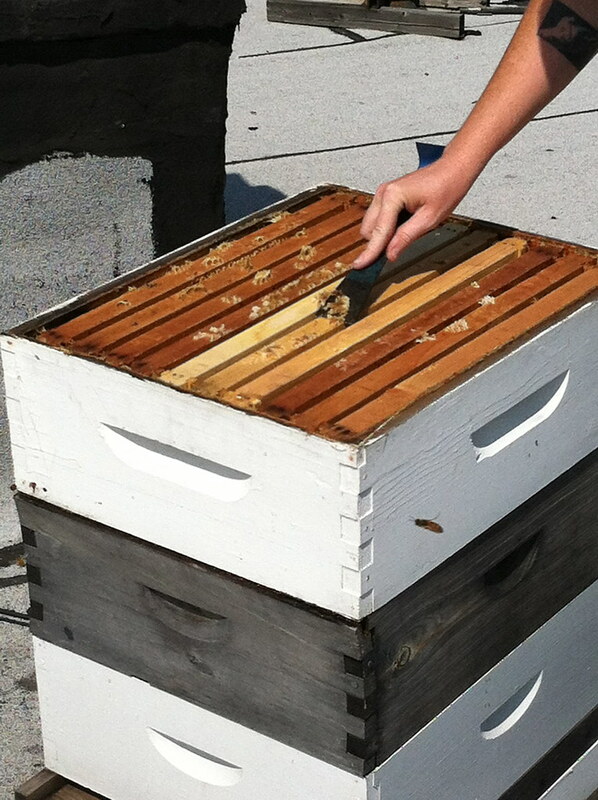 Shake that baby free of bees and place in a box to the side to prevent bees from trying to get back on. We took about 8 frames total to harvest. 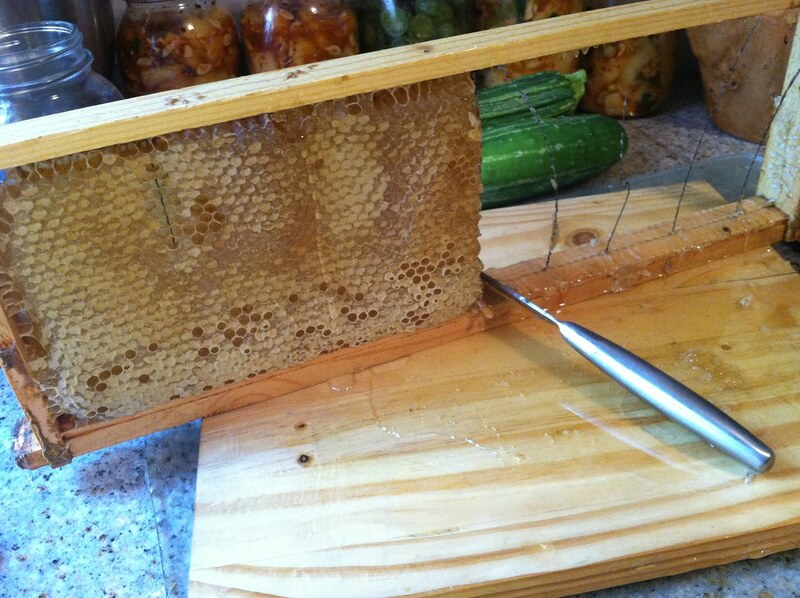 We got out of the hot sun and in to the cool kitchen, where we cut the comb off the frames. 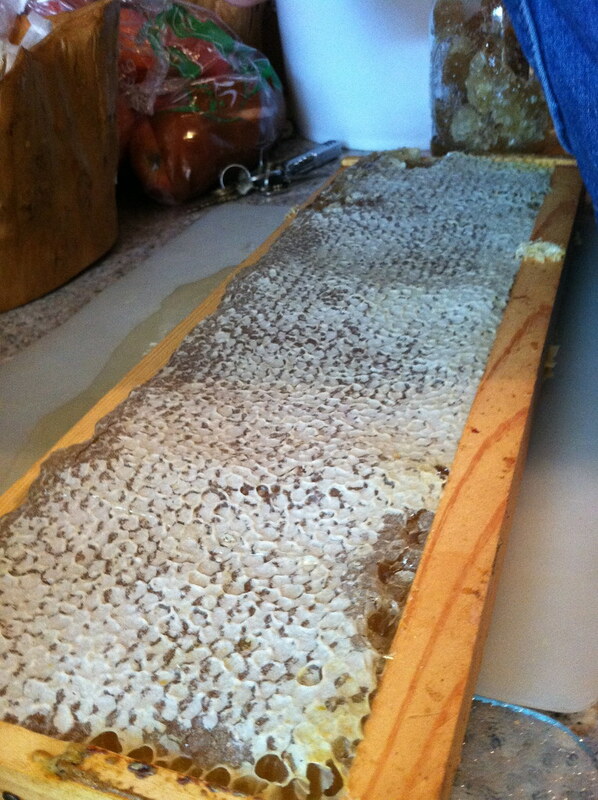 After the comb has been cut, it goes in to a bowl where the cells need to be crushed as much as possible with a spoon. 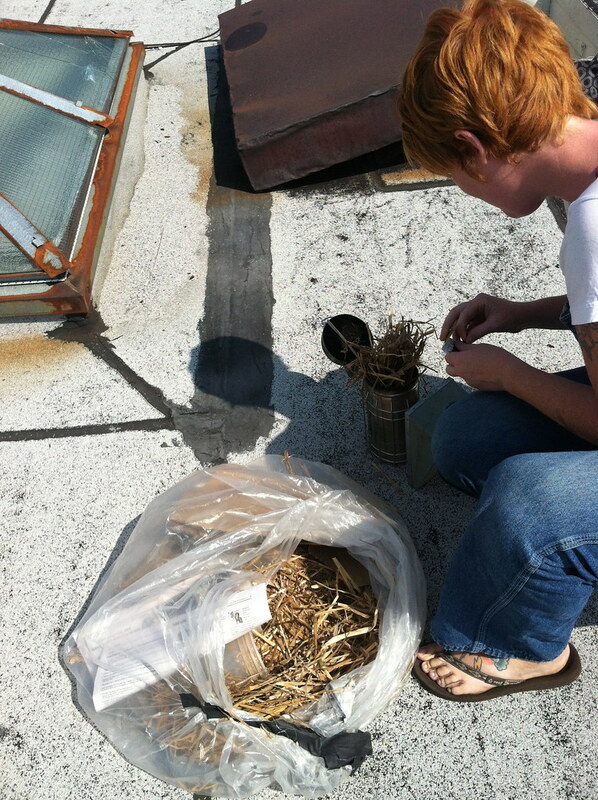 After this, the bowl is poured in to a strainer on top of a bucket, where it filters and can then be poured in to jars. Gorgeous and fairly uncomplicated, but very sticky! 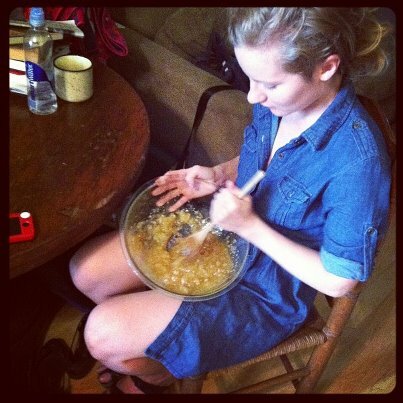 We each got a jar to take home, and I am taking a spoonful a day to help keep my allergies at bay. 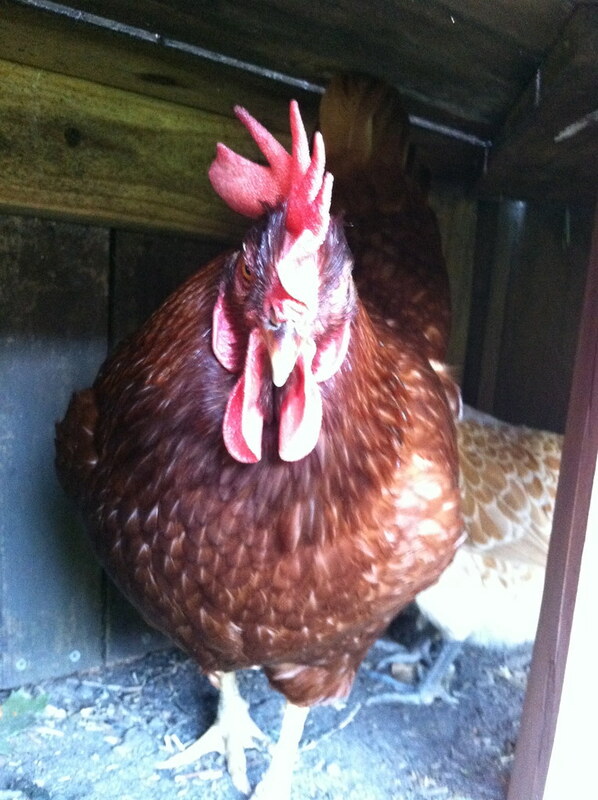 As I left with my honey to go home and make pickles, Meg’s cat Myra that I am in love with tried to escape, but I caught her! 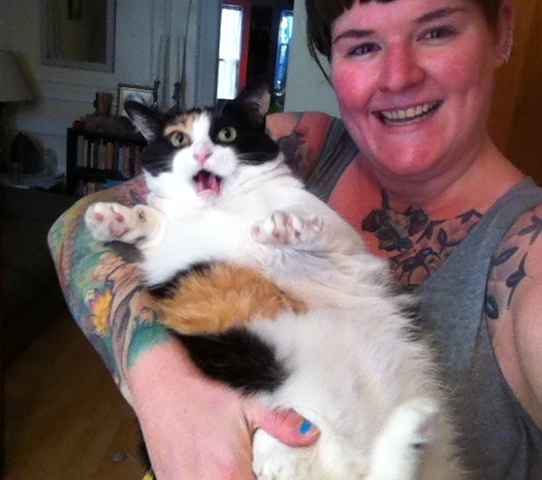 Look how happy she is to be picked up! haha. 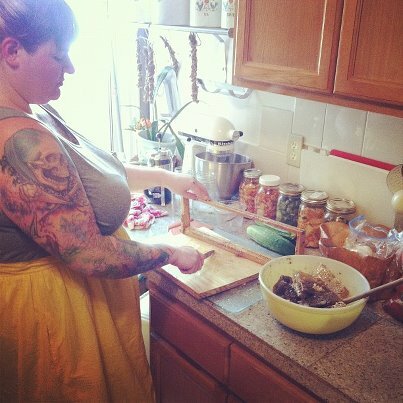 And now its time to make pickles! 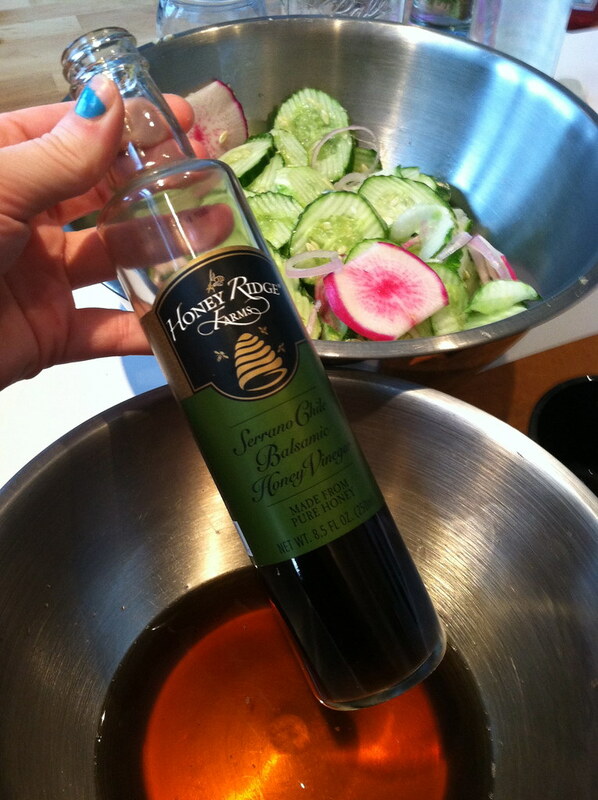 I have been having so much fun working with the great products from Honey Ridge Farms, the last being the great honey mustard marinade I made with their balsamic honey vinegar, and I had been eyeing the serrano honey vinegar in my cabinet. 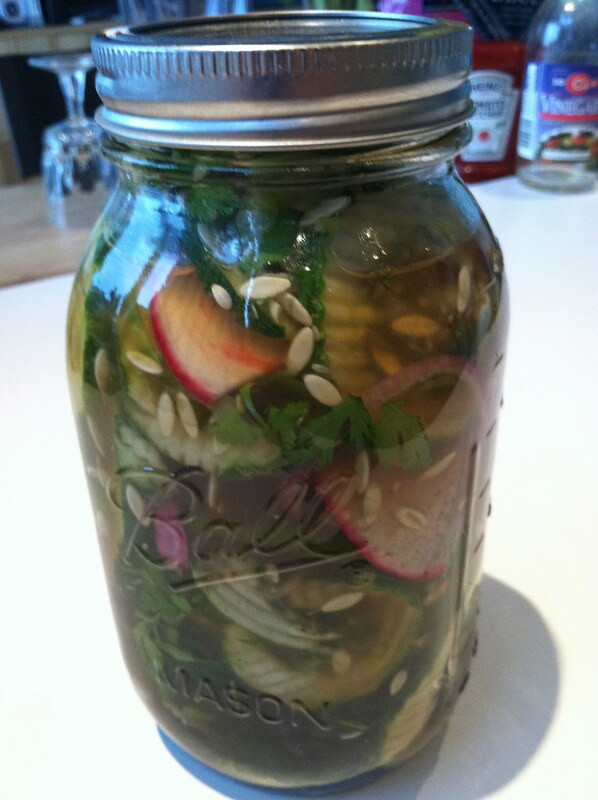 When we got a boatload of cucumbers in our CSA, I knew the time had come to make pickles! Makes – 32 OZ, split as you like. 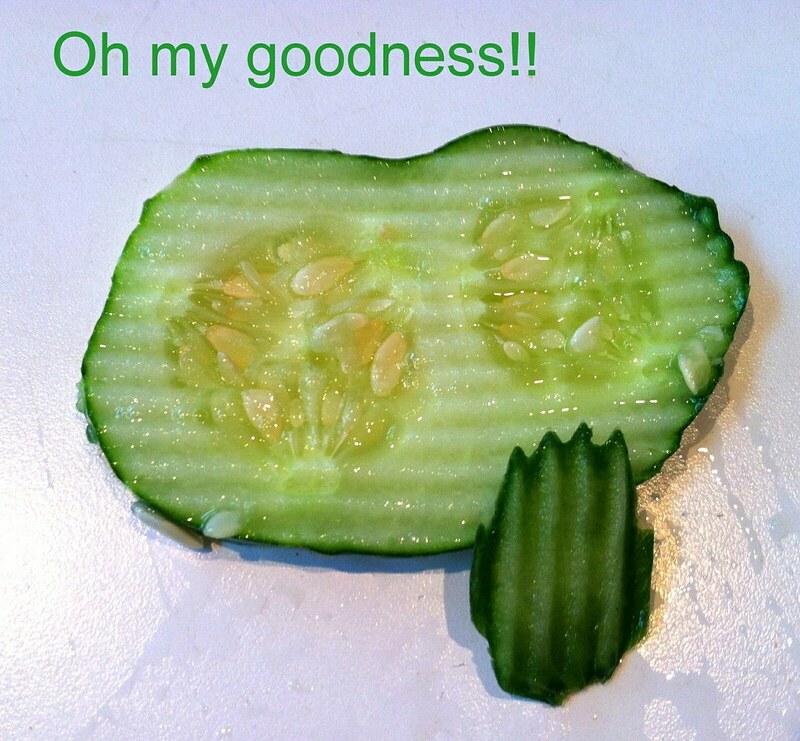 Slice your cucumbers and radishes, and don’t forget your chainmail glove! After your veggies are cut, mix everything else together in a bowl and taste until satisfaction occurs. Since you do not need to dissolve any sugars, it is unnecessary to heat this, which I love. 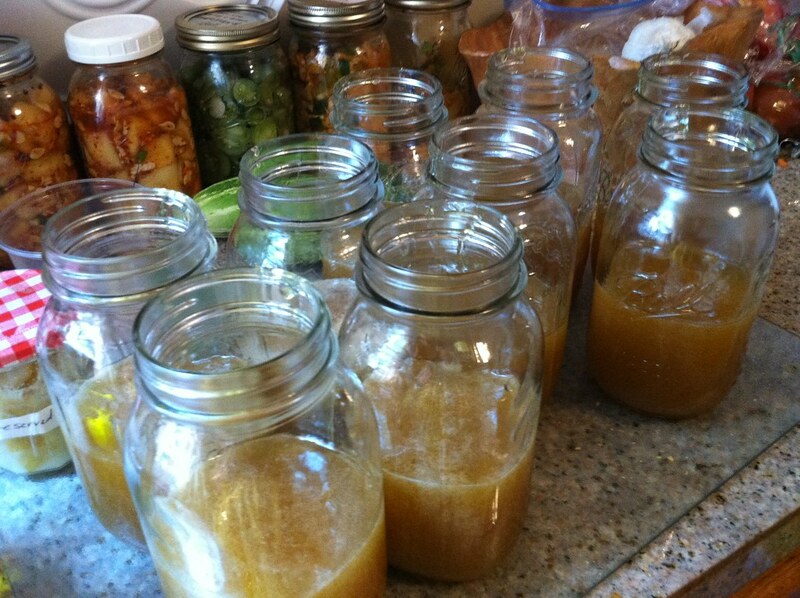 Smush all your veggies in to the jars you are planning to use and pour your honey vinegar mixture evenly across all of them. 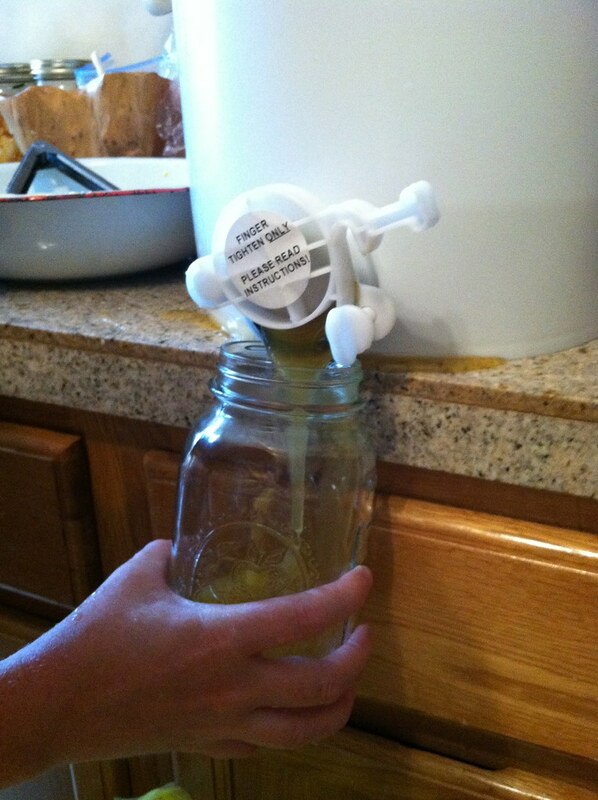 The fill the rest of the open space in each jar with clean water, leaving 1/2″ headspace if you are planning to waterbath them, and if not, take it to the top! Shake all the jars to get the liquids mixed, and voila! 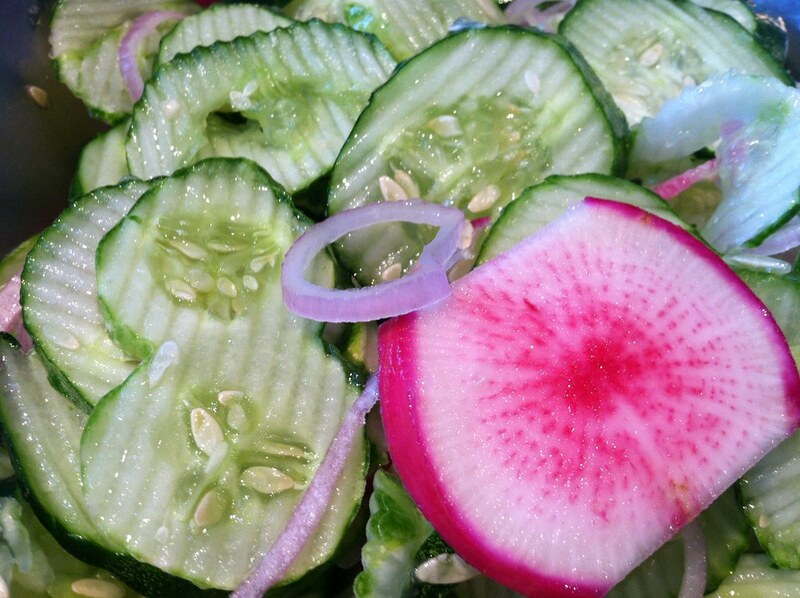 Sweet, spicy, tart pickles! I have been absolutely devouring these babies. I originally intended on waterbathing some for later in life, because I was afraid they would turn out too sweet like those weird little canned ones at the store, but these have a GREAT balance. I would actually like to add actual serrano peppers next time for even more kick! YUM. 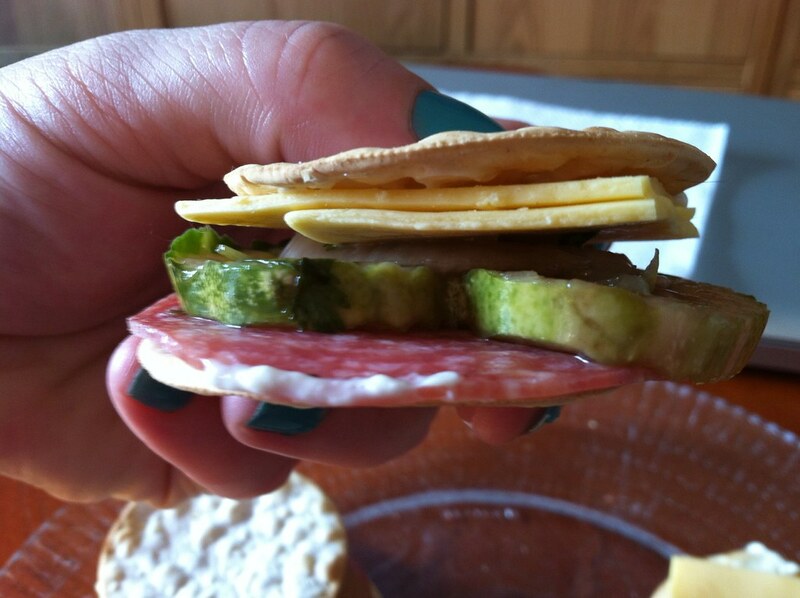 Great on egg salad, sammiches, and my favorite, crackers with salami and cheese! Also known as “picnic dinner” or in this case, picnic snack, as I was too busy to actually stop and make myself anything. NOM NOM NOM. Pingback: CSA #1! And UFTB’s 2 year anniversary! | ugly food tastes better.